Cozee Inn is located at 410 W. Verona Ave. in Verona. Take Hwy 18/151 west of Madison to County Road MV west to Verona. Scholarship applications can be obtained by mail or e-mail from Debbie Kind, scholarship chairperson. Contact her at W6690 Kiesling Road, Jefferson, WI 53549, or at kindangus@compufort.com. Applications must be postmarked by March 1, 2006. Scholarship winners will be announced at the Spring Futurity Sale, March 18th at Lancaster, WI. The Wisconsin Angus Auxiliary presented three scholarships to Angus youth who are members of the Wisconsin Junior Angus Association. Bethany Kohl, Waterloo, and Kayla Downing, Waukesha, received the scholarship for high school seniors who plan to pursue a college education. Kohl, the daughter of Dennis and Mary Kohl, will represent the state in the national scholarship competition. She is a past Angus Queen and current secretary of the junior association. Downing, the 2004 Junior of the Year, is the daughter of Dan Downing. She is now serving as treasurer of the junior association. Keela Retallick, Glen Haven, received the $500 scholarship for post-secondary education student. Applicants must be a current or past member of the Junior Association, have completed one year of post-secondary education and currently enrolled as a full time student. Retallick, the daughter of Kevin and Keri Retallick, is the past president of the junior angus association. Debbie Kind, Jefferson, is the scholarship chairman for the Wisconsin Angus Auxiliary. 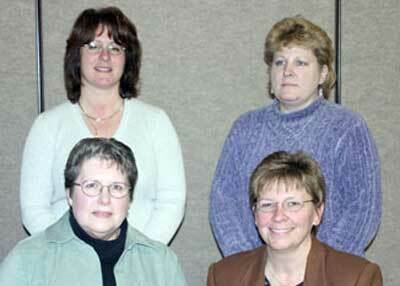 Front row: President Phyllis Tomaw; Secretary/Treasurer Kathy Miller. Back row: Membership Co-chair, Chris Konkel; Ambassador Chair Mary Kohl. At the annual meeting of the Wisconsin Angus Association, Bethany Kohl of Waterloo relinquished her crown to the 2005 Miss Wisconsin Angus, Courtney Jentz. Courtney, daughter of Greg Jentz of Fennimore, will assume the duties coordinating ambassador participation at various local, state and national activities. The Wisconsin Angus Ambassadors for this year will be, Kori Konkol, daughter of Kevin & Chris Konkol, Menomonie Falls, and Kaley Bockhop, daughter of Kevin Bockhop, Belmont. 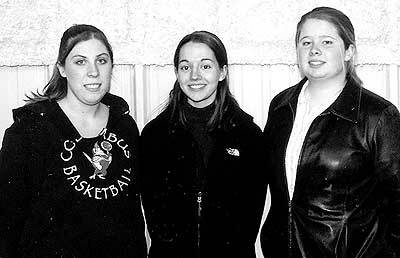 These three young ladies will represent the Wisconsin Angus Association and the Angus breed thoughout the year, attending all Angus related shows in Wisconsin as well as the National Junior Angus Show in Denver, CO this July. They are all active members of the Wisconsin Junior Angus Association. They also assist the Wisconsin Angus Auxiliary with their various fundraisers and activities. Promoting the Angus breed is their primary responsibility. If you would like to have them attend your event please contact Mary Kohl, Ambassador Chairperson at (920) 623-3984. Each year the Wisconsin Angus Auxiliary offers scholarship opportunities to graduating high school seniors. Applications requirements include participation in Angus activities and membership in the Wisconsin Junior Angus Association. This year applicants will compete for the top three places offering scholarships at $800, $600, and $400 respectively. The top-placing individuals will have an opportunity to compete on a national level for scholarships offered by the American Angus Auxiliary. The Wisconsin Angus Auxiliary voted at their annual meeting to offer one lifetime $500 scholarship to post-secondary education students. Applicants must be current or past members of the Wisconsin Junior Angus Association, must have completed one year of college or technical school, and be enrolled as a full-time student. Scholarship applications can be obtained by mail or e-mail from Debbie Kind, scholarship chairperson. Contact her at W6690 Kiesling Road, Jefferson, WI 53549, or at kindangus@compufort.com. Applications must be postmarked by March 1, 2005. Scholarship winners will be announced at the Spring Futurity Sale, March 20th at Lancaster, WI. To support the Wisconsin Angus Auxiliary projects the ways and means committee holds fundraising events including our dessert auction, held at the Wisconsin State Futurity Sale in March, generating the majority of our funds. We wish to thank those breeders who support this event with their generous bidding. During this sale the Auxiliary also hosts the food stand. Annually we offer for sale CAB® summer sausage and cheddar cheese gift boxes in the fall. There are several options to fit any budget and can be used as customer appreciation gifts or for that hard to buy for friend. For order information contact Susan Quam at sgquam@charter.net or 608-575-9504.